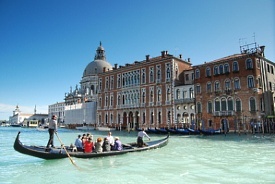 Cruises from Venice depart from spring through fall. With its palazzos, bridges and famous canals, this is one of Italy's most enchanting and romantic cities. Wander the piazzas and alleys or glide through the narrow canals in a gondola. A guided city tour is a good choice for first-timers, typically taking in the Basilica San Marco, the Doges' Palace and the Basilica Museum. Some excursions visit Murano, center of Venetian glassmaking.